The seven-year process of siting, conceptualizing, designing, funding and building the Global Hub included input from many committees of faculty, students, alumni and staff. Not surprising, top of the wish list from faculty and staff was having more open space to facilitate greater collaboration. “Having free flow between departments and encouraging interactions between faculty and practitioners with different perspectives are very useful and very fruitful. It shapes how we talk about issues in the classroom and where we see interesting research opportunities at the boundaries of these disciplines,” said Martin Lariviere, the John L. and Helen Kellogg Professor of Operations and chair of the operations department. In addition to housing all seven of Kellogg’s academic departments and its four strategic initiatives, the Global Hub will be home to the Weinberg College Department of Economics. “We are delighted that our world-class Economics department will be housed in the Global Hub, a signature interdisciplinary space at Northwestern. 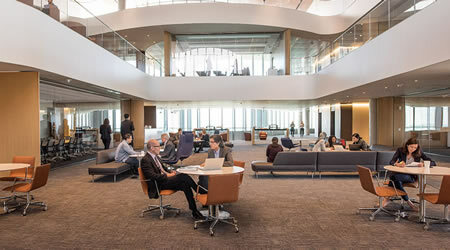 We have no doubt that the space will enhance the collaboration between economists in Weinberg College of Arts and Sciences and their counterparts in the Kellogg School of Management,” said Adrian Randolph, Dean of the Weinberg College of Arts and Sciences. Built to be a truly global hub, Kellogg’s new home is designed to welcome academics and practitioners from around the city, country and world. This made the environment and the aesthetics particularly important. “We wanted this to be a place that people would want to travel to, to be a central node in the global network of business thinking,” added Robert Magee, the Keith I. DeLashmutt Professor of Accounting Information and Management.